Basecamp 3 is a business solution especially for growing companies in need of a centrally organized workspace. It is for the business owner and team who are getting overwhelmed by emails, conversation threads, project documents, status reports, and other work items scattered all over the place. With a seamless combination of tools packaged in a single application, users are able to see what needs to be done and by when. This past month, a batch of fresh updates, such as a new progress tracking chart, custom-colored folders, project tools, and more, become available. 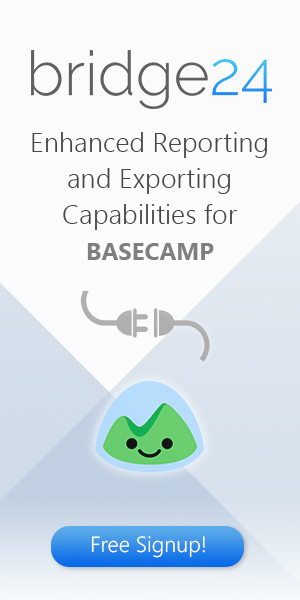 For a great reporting and exporting tool for Basecamp, we recommend you use our own tool Bridge24 for Basecamp. We are excited to announce that Bridge24 has been accepted in the App Extras directory for Basecamp. 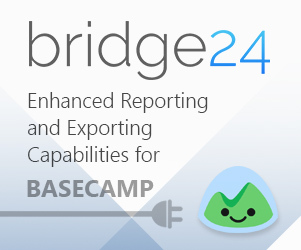 Bridge24 for Basecamp is a reporting and exporting application that enhances the functionality of Basecamp. Access the Basecamp Extras page detailing the connection with Bridge24 in the reporting section. 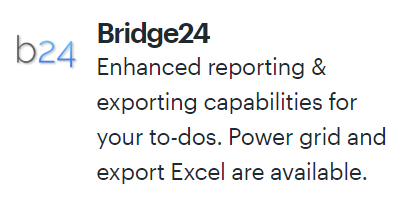 Bridge24 was classified in the Reporting category since one of the main uses is to dynamically display and filter Basecamp to-dos and of course create reports. Although it does much more than that, including a power grid and exporting any view to Excel. Basecamp project management and team communication software is helping more and more companies get a better handle of things. By seeing exactly what needs to be done, teams and organizations have become more efficient in how they accomplish work. At Basecamp itself, employees frequently make presentations, such as mockups or interface design revisions. When presenting before and after screens, they are usually limited to showing only full-width images. Thus, presenting a comparison is difficult, until about a month ago. Now, users can add image galleries to support and enhance their writing. Also available are enhancements on toolbar for images, and support for recurring events. For a great reporting and exporting tool for Basecamp, we recommend you use our own tool Bridge24 for Basecamp. Basecamp announced that they have stopped with their own SMS verification program as a security factor for signing in. This is in light with the report from the US NIST that SMS as a second security factor is insecure and is no longer recommended when signing in web applications. Therefore, Basecamp has switched to Google’s 2 Factor Authentication system since July this year. It also has new features such as a brand new tab, a view switcher, and other updates since version 3.9.3. For a great reporting and exporting tool for Basecamp, we recommend you use our own tool Bridge24 for Basecamp. Basecamp solves many business communication problems by keeping everyone on the same page. The online software has helped thousands of companies get a better handle on their business. Projects get off the ground faster when teams are collaborating more and communicating efficiently. It has web and desktop versions, but also works on mobile devices. A couple of months ago, it announced screen improvements on Hey!, the go-to screen for all communication and notifications, on its Android app. For a great reporting and exporting tool for Basecamp, we recommend you use our own tool Bridge24 for Basecamp. Basecamp online software for project management and team communication helps people work in one organized place. Although work nowadays is not necessarily confined in one room or office, users can still keep everyone on the same page with the help of its native apps on mobile devices. The PM software is ready whenever and wherever they are. In fact, the latest release 3.9 for iOS devices is providing improved usability features, especially for team members on the go. For a great reporting and exporting tool for Basecamp, we recommend you use our own tool Bridge24 for Basecamp. Basecamp is a web-based application for managing projects and organizing team communications. In its latest version, Basecamp 3 included Clientside, a feature especially for client services firms. It is a separate space with its own tools and interface for managing all client-facing communications. It worked well for some, but many found it not collaborative enough. So, the Basecamp team went on working to find a better solution. After a couple of months, they launched the new feature called Clients. For a great reporting and exporting tool for Basecamp, we recommend you use our own tool Bridge24 for Basecamp. Basecamp project management and team communication software helps its users organize their project tasks, documents, and communications in a central workspace. Most customers report of having a better handle on their business after bringing their work in Basecamp. Other benefits from having a centrally organized project management application are increased project visibility and team accountability. Also, teams can launch their projects faster, but with fewer meetings. For a great extension to Basecamp, we recommend you use our own tool Bridge24 for Basecamp. Last mid-December 2017, the company announced a visual refresh to make the application easier to use. One of the first major changes centered on the simplification of the navigation bar. From 7 items on the menu, it was reduced to 4, namely: Home, Hey!, Activity, and Find. Under the Hey! menu, users will also find their Pings direct messages and Campfires chat rooms. And as previously, users can find their posts, comments, assignments, check-ins and @mentions there also. Basecamp started in 1999, and since then went through a few transformations. 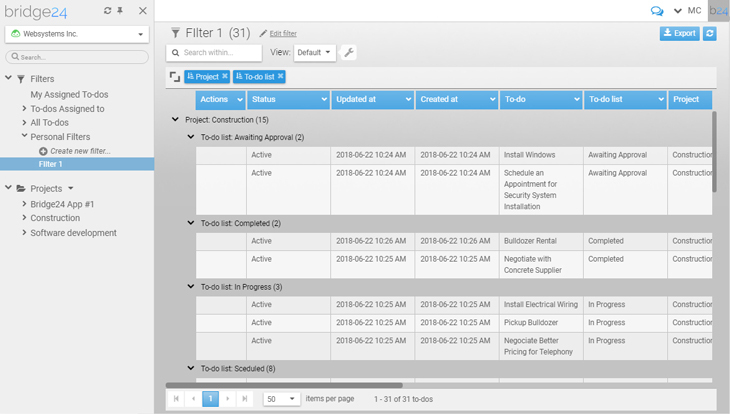 Today, it is on its version 3, and it continues to provide users all the tools that their teams need for project management and collaboration. Recently, the Basecamp team announced that they will be rolling out some visual refinements over the next few months. Their aim is to minimize the complexities that have build up over time. They believe they can add power and clarity while making the app feel simpler and more approachable to users. In fact, Phase 1 redesign is now live. For a great extension to Basecamp, we recommend you use our own tool Bridge24 for Basecamp.